Yesterday I used a mobile boarding pass for the first time. United Airlines’ checkin didn’t make me choose between mobile and paper, so I chose both — it wasn’t a risk to try mobile because I would have the paper as a backup, just in case. I clicked “Mobile” and had it sent to my phone via email. I then retrieved the email on my phone and tapped the link. 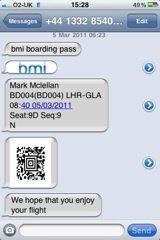 The boarding pass opened just fine in the phone’s browser (see image at right). Using the mobile pass to board was even more straightforward. United’s gate agent was clearly used to them, and everything went smoothly. If the browser is not the current app (e.g., if I’ve been checking my email), bring it to the front. Ensure that the screen doesn’t go blank before I have to scan the code, or I’ll have to do steps 2 & 3 again. For me, it’s just more trouble than it’s worth. It’s cool and all that, but there are too many steps. I can tuck the paper pass into my passport (which I use for ID whenever I travel, even domestically) and it’s always right there in front. Paper is very lightweight. It doesn’t need to be awakened or given a security code. I can check my email without sending it to the background. I can keep it in the same place and bring it out whenever it’s needed, without worrying about what else I might need it for. And I can even write things on it if I need to. I’ll use mobile again if I am someplace where I can’t print the boarding pass. But when I can use paper, I will. 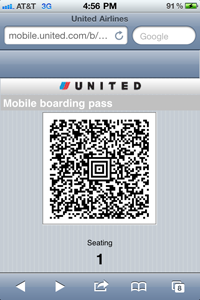 Do you use mobile boarding passes? What do you think of them? This entry was posted in Mobile, usability. Bookmark the permalink. Post a comment or leave a trackback: Trackback URL. The airline industry has invested a lot in this. And even though each boarding pass is just a little paper, replacing half or more of them would save a lot of paper. Not sure if the environmental positive of less paper would be offset by the additional electricity to run the phones. I would expect that the industry will be pusing this over the next 2-3 years. I’m an extreme user in that I would be happy if I never had to print out a form/ticket again: I don’t have a printer (to be honest, there are very few occasions these days where I need one), I’m not very good with paper anyway (it tends to end up scrunched up in my laptop bag) and in the case of flying am likely to have multiple sheets of paper with plane and connecting train codes. So I was excited to try out the BA app to board a LHR>DEV flight. (I should point out I also had a print version, but mainly because I’d only found out about the mobile site just before I went to the airport). The only thing I’d be careful about is having enough battery, but other than that loved the experience — as you have to use the boarding pass three times (once at check-in and twice for boarding), it’s nice not to have to worry about scrounging around for the sheet of paper. For me, having to print something is more of a hassle than the pause to bring a mobile one up on screen. I’ll keep using paper as primary, because this technology doesn’t offer enough convenience to make up for the hassle. If the phone sensed when it was near the boarding pass scanner, and switched automagically, then I might explore it. Being dependent on technology is risky, because I can guarantee my phone battery will give out when I’m trying to get through security or board the flight. If you use an iPhone with no replaceable battery, or don’t carry a spare battery, you’ll find you like paper, too. I helped launch this technology in the US with Continental and TSA back in 2007. One of the things that nobody talks about is that MBPs are much more SECURE as well. So secure that the same technology can be used for mobile payment. Thanks for commenting. In what way is mobile more secure? I can see that it would be for those of us (including me) who protect our phones with passcodes, and I’d like to know if there’s more to it than that. I hope you will explain what makes mobile more secure. P.S. In my world, “MBP” means MacBook Pro. Just a hint to spell out initialisms and acronyms the first time. It’s not just about the paperless boarding card it is the whole user journey – if you’ll pardon the expression. It starts with check in. When we are in Italy or Scotland we do not have easy access to the internet except on our iPhones and certainly no printers. We like to check in as soon as the flight opens – 24 hours before departure. The British Airways app allows Mary to choose an emergency exit row for the extra legroom. It would be extra hassle and time to track down an Internet cafe and log in to print off a paper boarding card. I do not keep my iPhone in a case, it lives in my jeans pocket or jacket pocket easy to grab when needed. So I always know where it is. Much more preferable to rummaging about in bags for a crumpled or bent paper ticket. As for the unlock I hardly even notice it. I do it all the time when using the phone for other purposes like making calls, or googling or playing Angry Birds so why would check in be any different. The BA ticket is not just the bar code it is also human readable for that final check by the cabin staff as we enter the plane. 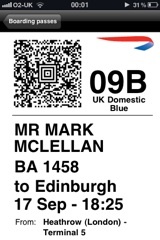 See BA e-boarding card image. We love e-boarding cards and wouldn’t go back to paper boarding passes unless there was no other option. Mind you it is important to keep enough charge to get you as far as your seat. Paper needs no batteries. 1. Using my mobile while overseas would involve the very hefty data roaming charges, unless I’m someplace where I can connect to the wifi. 2. Since I carry my laptop everywhere anyhow, I’d use that to connect to the wifi, because of its larger screen. 3. I can’t check in online to return home from Rome, at least not on United. 4. I belong to United’s Economy Plus Access, so I get an extra 5″ of legroom on every flight anyhow. btw, I always know where my phone is, too. It just takes more work to get it out of there than to pull a piece of paper out of a pocket.I agree about using the passcode often, but the fact remains that it is an additional step beyond what is required to pull out a piece of paper. Each step is small in itself, but they add up.